On this day, 74 years ago, Buchenwald concentration camp was liberated by the American army. Buchenwald was established in Weimar, Germany in 1934 and was one of the largest work camps created. It was infamous for its brutality and cruelty—a place of forced labor, medical experimentation and widespread death, with over 56,000 murdered. The Jewish Museum has countless objects, documents and photos in their collections from Buchenwald in addition to their Holocaust exhibit focused on Buchenwald survivor, Leon Greenman. This prisoner card, donated by Mark Goldfinger to the museum in 2013, calls attention to the details that the SS found important to document, degrading him, dehumanizing him and marking him with a number, stripping him of his identity and reducing him only to the information on the card below. The meticulously kept records of Nazi Germany tell an elaborate story about the detailed organization of the concentration camps as well as the purposefully strategic dehumanization of the Jewish people. Häftlings-Personal-Karte, or prisoner “personal” cards were issued to prisoners upon arrival, thoroughly documenting all physical and background characteristics of incoming prisoners including their height, body type, religion, and birthdate, and going even more specific in their physical characteristics marking their face shape, eyes, nose, mouth, ears teeth, and hair. In analyzing prisoner cards, a deeper story unfolds about the way in which the Nazis viewed and categorized their prisoners, carefully classifying them with a marking system to separate the reasons for incarceration. The cards also illustrate the arbitrary ways in which the SS focused on physical characteristics, like nose and head shape, in order to make broader anti-semitic generalizations about the prisoners. This registration card was issued to Mark Goldfinger, a fifteen year old boy born in Krakow and admitted into Buchenwald Concentration camp in the August of 1944. According to the document, he was born in Krakow in 1929, which would contradict the newspapers that report him dying at age 83 in 2015. If he were 83 at his age of death, this would mean he was born in 1932 rather than 1929, a lie he might have told, for many children were advised to say they were older than they actually were in order to be used for labor rather than instantly murdered. Goldfinger’s town was invaded when he was nine years old. His mother, aunt and one year old cousin were amongst a group of Jews that were immediately rounded up, shot and killed when the Germans invaded, a fact Goldfinger didn’t learn until over 25 years later. He was initially in Kraków-Płaszów labour camp where he came very close to death, and then was sent to a munitions factory in Skarżysko. After this, he was sent to Buchenwald until its liberation on April 11, 1945. His prisoner card has a section to mark if he is able bodied, or capable of work, as well as a section for punishments. There is also a place for the reason he was admitted, in which it is written that he was a “political Polish Jew.” This classification would have made him highly targeted in the camps, but as an able bodied young person, being capable of labour was a advantage that contributed majorly to his survival. The Nazis used different colored triangles to classify the prisoners based on their religion, nationality, sexual orientation or political status. These triangles were inscribed onto prisoner uniforms as well as being stamped onto identification documents. On the top right hand corner of Goldfinger’s prisoner card there is an upside-down triangle with a P in the center, indicating his identity as a Pole. The Nazis were exceptionally brutal to the Polish, considering them racially inferior. His religion is marked as mos, short for mosaisch, meaning the Jewish religion in German, another characteristic that would make him extremely vulnerable to persecution. 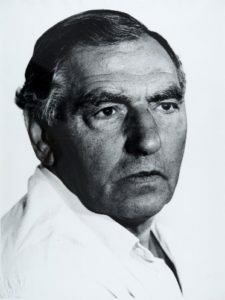 Goldfinger later married a Jewish German woman named Sylvia and moved to England where he became a member of the 45 Aid Society, a society built by survivors that raises money for charitable causes and creates a community for support and conversation. He made it his life mission to “ensure people don’t forget,” and continued to speak out to Londoners about his tragic experiences in the camps. Today, the registration cards serve as proof for many survivors, making their pasts tangible to them. Many cards, including my grandfather’s Buchenwald concentration camp registration card, even have the signature of the prisoner at the bottom, a striking sight. For here, it becomes quite clear that these were children signing off on their lives, with no choice and no ability to conceive what was about to happen to them. They were alone, and unsure, forced to sign their name with no real idea of what they were signing off to. 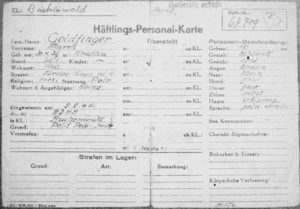 Goldfinger’s prisoner card continues to serve as a symbol of the deliberate and calculated atrocity that occured in Buchenwald, and in camps all throughout Europe. Today, we remember those who perished at Buchenwald, and those whose families and lives were irreparably impacted due to the evils that ensued there. Posted in Internships, Learning News by Rachel Milberg, Learning Intern on April 11th, 2019.